This is It is a line of clothes. We are producing cotton clothes based on the concept of "clothes for adult women enjoying living, comfortable clothes snuggling day by day" in Bali. Cloth arrived in the past and sold out was re-arrived ♪ It will be a new color black. There are also blue, purple, red, so please have a look at another page. Border of gold and bird pattern drawn on the whole are gorgeous and cute batik print skirt. There is no worry of being transparent because the lining is attached because it is a cotton fabric with tension. When it is cool, it is a piece, cold season is matching the leggings downwards, it is an item that makes all season active. The waist is supposed to be adjusted with a string with tassels on both sides. Tassel's color will be red. 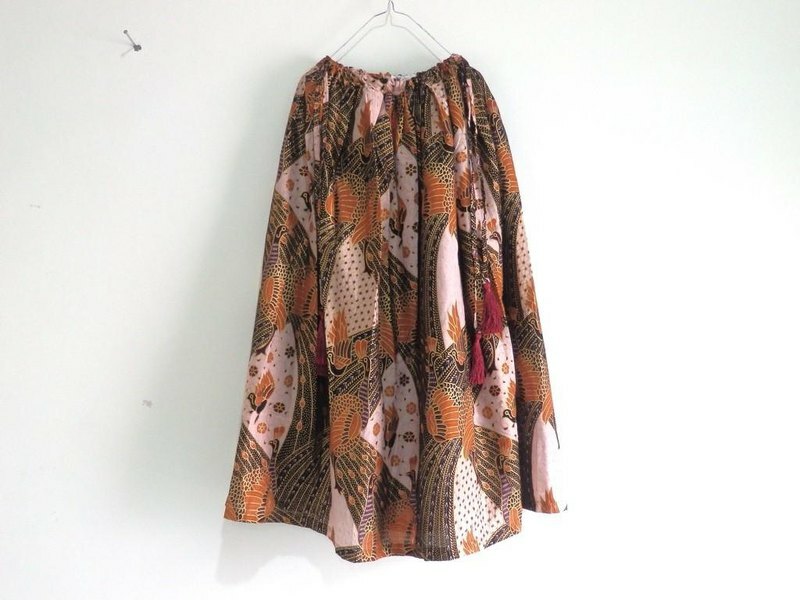 Material cotton 100 (Indonesian cotton) West 98 cm Hip 165 Skirt length 85 cm 【Care about maintenance】 It is thought that the color falls at the first washing. Before using, please wash your hands once or massage. Since it is a cloth of Indonesia, please continue your understanding and proceed to purchase. 【About Tassel's handling】 When washing, we recommend putting the tassel in the net so that it will not unwind, and hanging it on the hanger when dry. If it collapses, please extend it gently with a steam iron. 【About product image】 Regarding the color of batik, since faithful expression in the image is difficult, there are cases where the color slightly differs from the actual product.